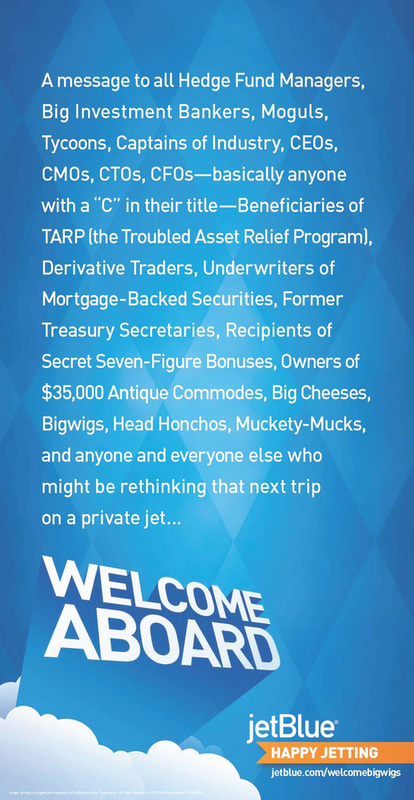 ​Case study of JWT and JetBlue's award-winning "Welcome Bigwigs" campaign from 2009, that lampooned corporate CEOs and their love of private jets. Long story short—the most powerful financial minds in the universe screwed up and came very close to sending us back to the stone age. Their companies needed bailing out, so they went to Congress in private jets to ask for the money. Even our friends at JetBlue—a massive, successful American aviation corporation—were all like, "oh, come the f--- on." So with their blessing, we went on the offensive, churning out ads, often overnight, targeting the private jet elite. Our pitch was simple—flying JetBlue was as close to private as they were going to get from now on. We recruited the voice of PBS's Frontline to deliver these stark warnings to CEOs.